Lost Art are in the final stages of the completion of works. Approx 80% has been finished as can be seen. Predictable delays to finalizing stone work due to ground frost, completion any time now. Three Planning Applications have been submitted – 1. The new Cafeteria; 2. Bowling pavilion and 3. Depot building. Consent for all 3 is expected by mid March. Will probably result in closure of cafe sometime during the summer months, mobile catering arrangements will be arranged to enable a service of light refreshments. Tolent have been on site for 20 wks following acceptance of the contract. Works have focused again on lake edges and islands plus preparations for bridge abutments and foundations etc. 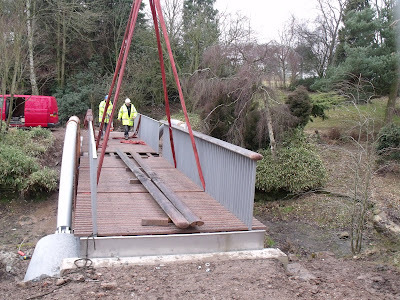 The Inlet Bridge at the TipKinder end of the lake was installed on 27th January about 1.30pm. 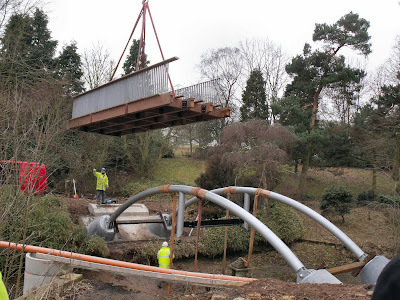 This will be followed by the installation of the Coronation Bridge next Wed 17th, which will be installed in 3 sections. Probably from mid morning on the 17th through to mid pm. on the 18th. This will be followed by the installation of the Burma Star bridges (x2) and the Broadwalk Bridge. 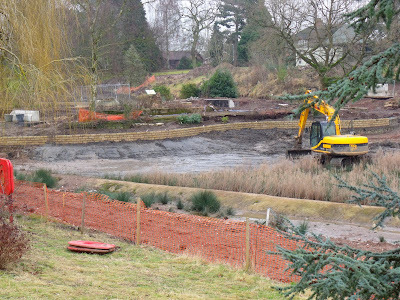 65% of the lake edge preparation wall works have been completed with only the West side of the island to finish. Approval of materials for coping stones is to be confirmed this week. There is some extensive work to access roads to be done, to support the large cranes needed to ‘swing’ the bridges into place. 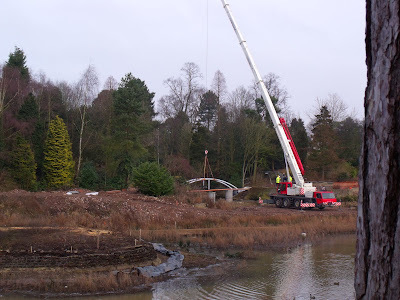 It’s good to see that last week and this week the Park is a hive of activity with 19 men from Tolent on site working on the lake edges and bridges with 15 also remaining on site this week. Five men from Lost Art are working on the completion of the bandstand and a team of 3 park gardeners have been clearing weeds and overgrown vegetation from the Coronation Walk Valley in preparation for the next contract package. 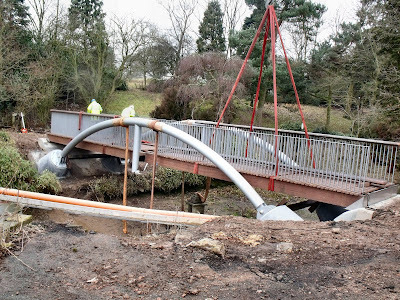 The cold weather has caused some delay however the contractor is aiming to catch-up as much as possible with bridge installations taking place almost back-to-back. The bridge fabricators are working very well off-site as will be seen by those visiting the factory in Huddersfield next Tuesday. 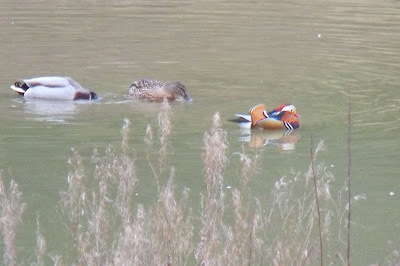 Filling of the lake is anticipated by the end of the summer subject to unknown obstacles. I would like to introduce you to Dave who has kindly attended from Tolent Construction – the main contractors on site; should anyone here have any technical questions or issues they wish to raise. (Open to floor). Thank you Dave. We are all eager to see the PG works commence and consultation with Sir William Stanier School has continued. An expression of Interest notice on the CE web site attracted 34 contractor responses. This has been whittled down to 6 potential suppliers. The disabled requirement has yet to be confirmed from the consultation with the additional funding sourced from an ex-C&NBC Mayor. The project will take 3 forms, appealing to all age ranges. Toddler Equipment, Youth Equipment and Equipment for All Ages i.e. Outdoor Gym style. Some works may be subject to further external funding which the Project Officer is pursuing. A copy of the children’s presentation which is being used to draw up the specification is available. • Play Ground Outdoor /Gym and possibly installations over 4m high. 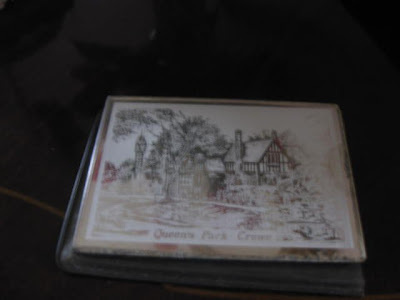 5 Places remain on the coach for anyone wishing to attend next Tuesday leaving QP Lodge at 10am. Seats will be allocated on a first come first served basis – does anyone here wish to attend please – it will be a very interesting day for all?